Discover the big landscapes and cool air of the Middle Atlas Mountains on a full-day, private excursion from Marrakech to Ouzoud Falls. Enjoy the flexibility of a personal driver, with the whole day to spot Barbary apes, hike at the edge of the falls, and sip tea in riverside cafes. 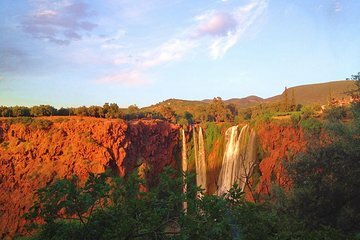 This 11-hour Ouzoud Falls trip includes lunch and a tea break, as well as pickup and drop-off at Marrakech hotels. Meet a driver at your accommodations in Marrakech for 8am departure, then board a private vehicle for the 98-mile (158-km. ), 2.5-hour trip to Ouzoud Falls. You’ll have great views of the desert and foothills as you wind into the Middle Atlas Mountains, whose cooler temperatures make the perfect escape from the Marrakech heat. Pause partway to Ouzoud Falls to stretch your legs and sip mint tea, then continue to a deep-red valley crowned with almond, olive, and fig trees. Upon arrival at the falls, take the day to explore the three-tiered cascades at your own pace. Hike to the stop to watch for rainbows in the mist, and spot the traditional oil mills driven by the powerful current. There are places to swim in the river, clusters of locally-owned shops packed with colorful handicrafts, and a series of restaurants set on small, riverside terraces. At the end of your day at Ouzoud Falls, meet back up with the driver for return trip to Marrakech, where this tour concludes with 7pm drop-off at your hotel.